Detect anomalies through behavioral analytics performed on correlated logs and packet analysis using advanced machine learning algorithms. Graphically position all your threats to logically prioritize response to incidents or threats based on severity of risk. 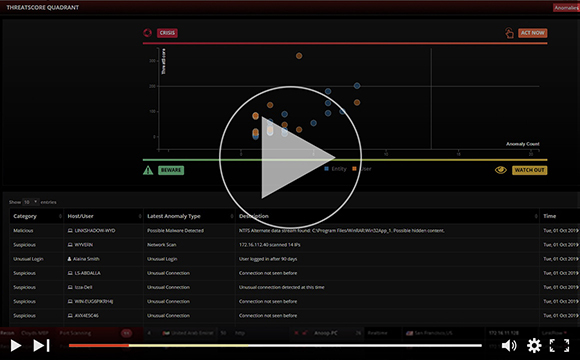 Monitor the threat score of your critical assets and to detect anomalous users and entities. Identify entity behavior that is most dangerous to your organization along with a description of the anomaly. New threats emerge every day from inside and outside the perimeter. Detecting these threats that bypass other security controls is important, but predicting their impact is even more crucial. Understanding behavioral patterns and correlating this information enables organizations to identify potential attacks with varying magnitudes of consequences and severity, and then prioritize actions to respond. LinkShadow performs anomalous behavior detection as all traffic coming in and out of your organization is constantly scanned. Detect threats, learn and adapt to user patterns, and keep track of everything, so that each attack can be scored for proper prioritization. See which entity is most dangerous to the organization by understanding where it can cause a crisis, or is something to be wary of, or should be watched closely, or needs to be acted on immediately.